Studies show that employee referrals are the number one source of quality hires. Not only do studies reliably demonstrate this, but as an experienced recruiter, you probably already knew that. Still, despite this knowledge, many companies struggle to implement a well-functioning and sustainable employee referral program (ERP). Have you ever wondered why so many ERPs fail? The answer is simple: Employee referral programs fail when the program lacks full backing or buy-in from the key personnel driving a successful program. A company’s management team, including both hiring managers and executives, must drive the ERP to be a success. If HR is able to secure full support from management, the ERP will be far more successful. To that end, this white paper will provide you with the tools you need to secure management buy-in to create a truly well-functioning and sustainable ERP. If you want to secure managerial support to guarantee the success of your ERP, approach management with a strong business case. To be successful, the business case must be drafted and presented with consideration for what factors really influence the manager’s thinking. 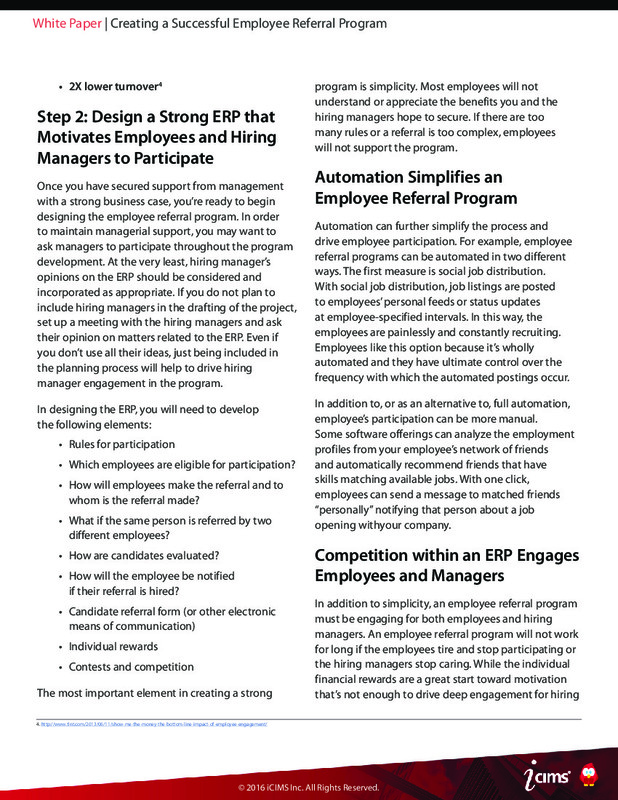 HR can frame the argument in support of the ERP in a way that will inspire management to fully support the program. 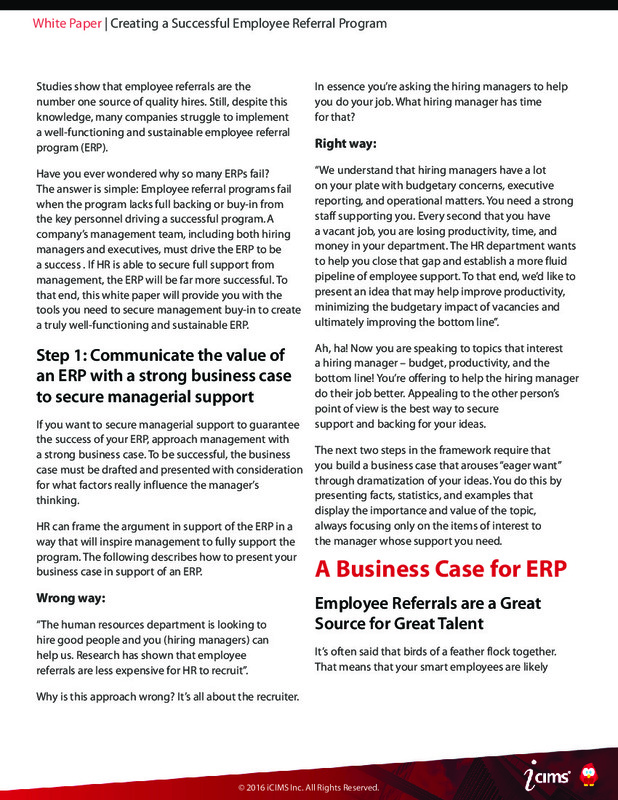 The following describes how to present your business case in support of an ERP. "The human resources department is looking to hire good people and you (hiring managers) can help us. Research has shown that employee referrals are less expensive for HR to recruit". Why is this approach wrong? It is all about the recruiter. In essence you are asking the hiring managers to help you do your job. What hiring manager has time for that? “We understand that you hiring managers have a lot on your plate with budgetary concerns, executive reporting, and operational matters. You need a strong staff supporting you. Every second that you have a vacant job, you are losing productivity, time, and money in your department. The HR department wants to help you close that gap and establish a more fluid pipeline of employee support. To that end, we’d like to present an idea that may help improve productivity, minimizing the budgetary impact of vacancies and ultimately improving the bottom line”. Ah, ha! Now you are speaking to topics that interest a hiring manager – budget, productivity, and the bottom line! You are offering to help the hiring manager do their job better. Appealing to the other person’s point of view is the best way to secure support and backing for your ideas . When one considers the cost of a job vacancy in terms of over-taxed employees, overtime pay, potentially lost revenue, lost opportunity, customer attrition, lost experience, and competitive advantage costs, it becomes very clear that filling positions quickly and retaining employees is imperative2. Studies show that applicants hired from an employee referral begin their position more quickly than applicants found via job boards (29 days compared with 39 days via job boards)3. Referral hires have greater job satisfaction and stay longer at companies – 46% stay over 1 year, 45% over 2 years and 47% over 3 years3. 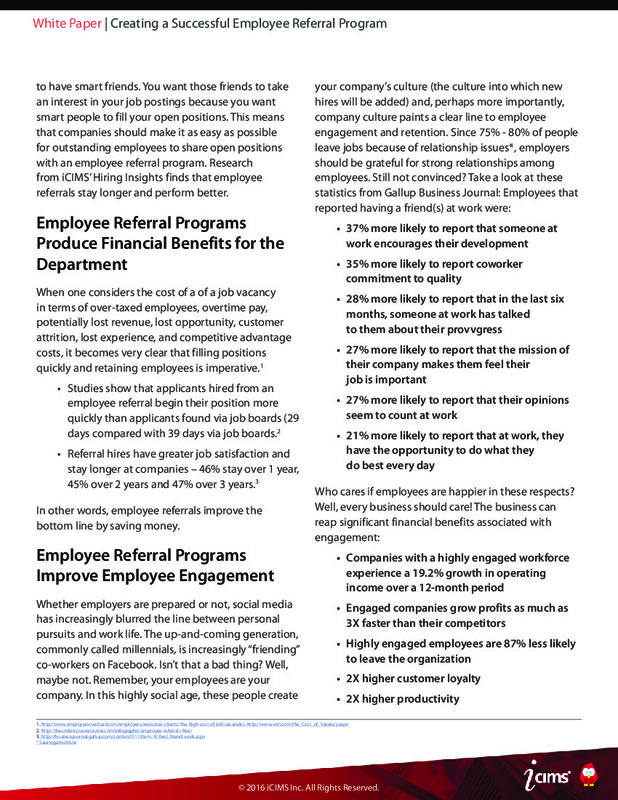 In other words, employee referrals improve the bottom line by saving money. Once you have secured support from management with a strong business case, you are ready to begin designing the employee referral program. In order to maintain managerial support, you may want to ask managers to participate throughout the program development. At the very least, hiring manager’s opinions on the ERP should be considered and incorporated as appropriate. If you do not plan to include hiring managers in the drafting of the project, set up a meeting with the hiring managers and ask their opinion on matters related to the ERP. Even if you do not use all their ideas, just being included in the planning process will help to drive hiring manager engagement in the program. Which employees are eligible for participation? How will employees make the referral and to whom is the referral made? What if the same person is referred by two different employees? How will the employee be notified if their referral is hired? The most important element in creating a strong program is simplicity. Most employees will not understand or appreciate the benefits you and the hiring managers hope to secure. If there are too many rules or a referral is too complex, employees will not support the program. Automation can further simplify the process and drive employee participation. For example, employee referral programs can be automated in two different ways. The first measure is social job distribution. With social job distribution, job listings are posted to employees’ personal feeds or status updates at employee-specified intervals. In this way, the employees are painlessly and constantly recruiting. Employees like this option because is wholly automated and they have ultimate control over the frequency with which the automated postings occur. In addition to or as an alternative to full automation, employee’s participation can be more manual. Some software offerings can analyze the employment profiles from your employee’s network of friends and automatically recommend friends that have skills matching available jobs. With one click, employees can send a message to matched friends “personally” notifying that person about a job opening with your company. In addition to simplicity, an employee referral program must be engaging for both employees and hiring managers. An employee referral program will not work for long if the employees tire and stop participating or the hiring managers stop caring. While the individual financial rewards are a great start toward motivation that is not enough to drive deep engagement for hiring managers and employees. To that end, a strong employee referral program may benefit from including a little harmless competition drawing in employees and hiring managers. For example, recruiters may consider facilitating departmental competition where the teams compete against one another for a “grand prize” associated with the most employee referral hires per quarter or half year. The grand prize should separately benefit both the hiring manager and the employee. For the hiring manager, consider rewards such as bonus and/or executive recognition. In this way, managers, desirous of financial recognition and/or an opportunity to network with the executive team will push their team members to participate. Motivate employees at the team competition level with high-level/executive recognition, like a certificate or trophy, free lunch for a specified duration, and/or some other benefit. 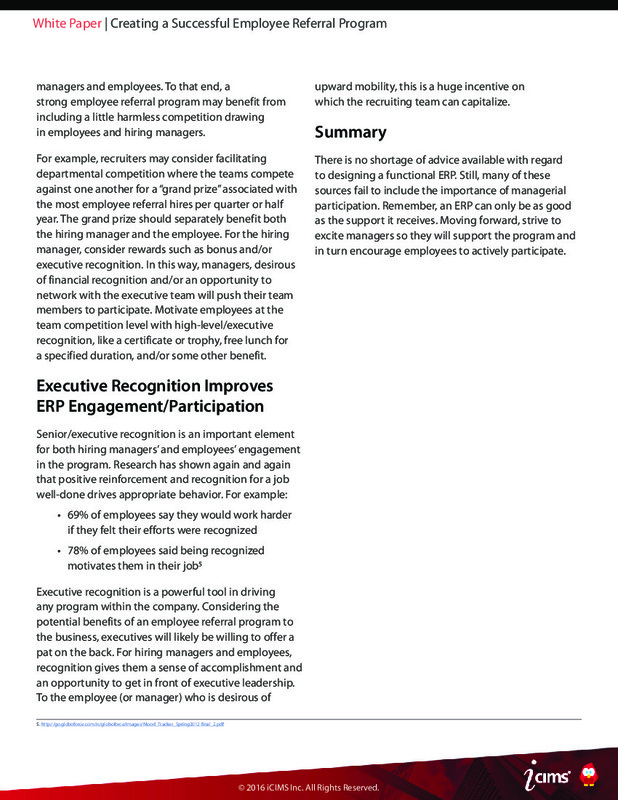 Executive recognition is a powerful tool in driving any program within the company. Considering the potential benefits of an employee referral program to the business, executives will likely be willing to offer a pat on the back. For hiring managers and employees, recognition gives them a sense of accomplishment and an opportunity to get in front of executive leadership. To the employee (or manager) who is desirous of upward mobility, this is a huge incentive on which the recruiting team can capitalize. There is no shortage of advice available in books and on the internet with regard to designing a functional ERP. Still, many of these sources fail to include the importance of managerial participation. Remember, an ERP can only be as good as the support it receives. Moving forward, strive to excite managers so they will support the program and in turn encourage employees to actively participate. 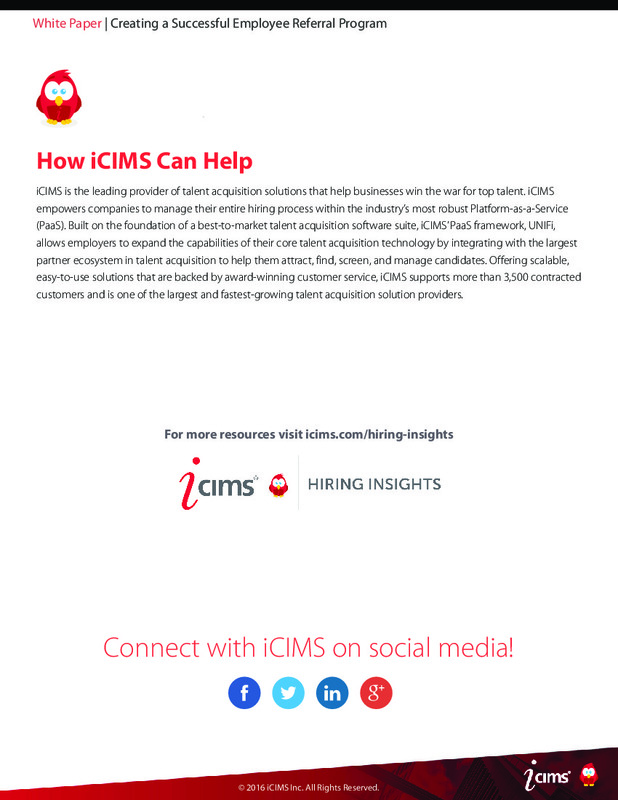 iCIMS is the leading provider of recruiting software that help businesses win the war for top talent. iCIMS empowers companies to manage their entire hiring process within the industry’s most robust Platform-as-a-Service (PaaS). Built on the foundation of a best-to-market talent acquisition software suite, iCIMS’ PaaS framework, UNIFi, allows employers to expand the capabilities of their core talent acquisition technology by integrating with the largest partner ecosystem in talent acquisition to help them attract, find, screen, and manage candidates. 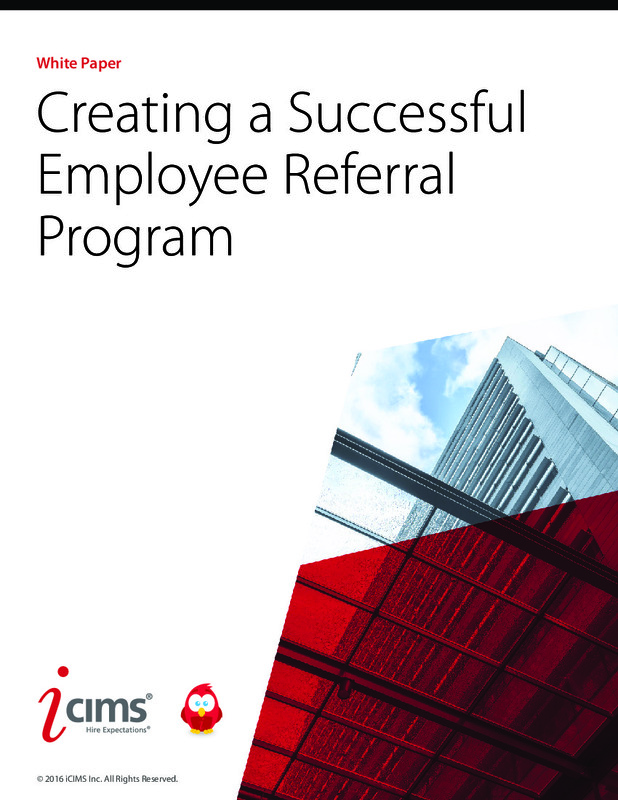 Offering scalable, easy-to-use solutions that are backed by award-winning customer service, iCIMS supports more than 4,000+ contracted customers and is one of the largest and fastest-growing talent acquisition solution providers.